Stories about General Volkare and his Lost Legion are whispered amongst the Atlanteans - some in hope, all with at least a sliver of fear. Now with word of what appears to be Volkare and his Lost Legion reappearing the scattered forces across the land are deciding which side is likely to be victorious. Are the Mage Knights the lessor of evils or is Volkare the true saviour they have been waiting for? Whether you and your fellow Mage Knights decide to work together or at cross purposes, make no mistake Volkare is a very powerful enemy. 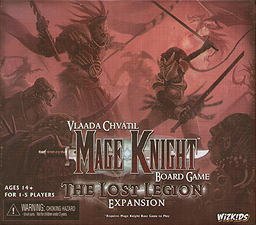 Continuing the saga of the worldwide acclaimed hit Mage Knight: Board Game, designer Vlaada Chvatil and WizKids deliver this expansion with a new playable Mage Knight and also all new spells, artifacts, skills, locations, scenarios, enemies and friends. Choose Wolfhawk, a new Mage Knight, or one of your favourite heroes, and prepare for General Volkare and his Lost Legion.